Are you Japanese? Well then congratulations because you can read English! 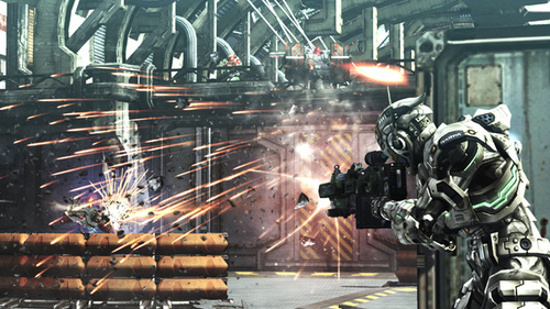 Your prize for this is to be able to download the Vanquish demo on to your PS3/ Xbox 360 on the second day of September. You lucky boy! However if you are not Japanese then you´ll either have to sit in shame, or download it through your Japanese accounts on your PS3. The game looks awesome, so hopefully we´ll get the demo soon after. Looks fun as hell, either way. I´ll definitely be picking this up when it comes out. Only a fool wouldn´t, you fool! Platinum Games recruitment comic features… BAYONETTA? Looks like it will be out in the US PSN and XBLA on the 31st! The 31st you say? Well then, I guess there’s no reason to make another JPN account then. I always hear about people using the Japanese PSN for stuff. How do you do that? You have to make a new profile on your PS3 and setup a Japanese account when you make a PSN ID for that profile. There’s several tutorials you can find through Google or YouTube.